When should you use a blunt generalist tool, and when should you use a sharper domain-specific tool? My reply to the answer thanked him for it, but mentioned that I think systemd is the right place to do this “sort of thing”. In reply to my reply, he told me that systemd is “absolutely the wrong place” to do this sort of thing, which is pretty strong language! I think we’re approaching this from different perspectives here, so let’s break the problem down in general terms. 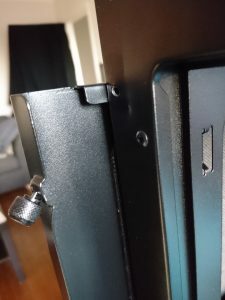 This entry was posted in IT, Linux, Sysadmin and tagged sysadmin, systemd on April 18, 2019 by Alex Forbes. It’s hard to watch The Big Short, and not come away thinking that the odds are stacked against you as a would-be individual investor. It’s a great film that makes some very valid points, but leaves you thinking. Surely if there are all these hedge funds that mismanage their clients’ money, and getting a seat at the big-boy’s table requires vast amounts of capital, there’s a gap in the market for cooperatively run mutual funds that actually act in their clients’ interests? It turns out that there are already companies in this space, but the chances are you wouldn’t hear about them from a financial advisor. This entry was posted in Articles, Finance and tagged fire, investing, money, personal finance, retirement, saving, vanguard on December 25, 2018 by Alex Forbes. This blog post is a follow-up to It’s Time to Ditch Gmail. It began as a review of Fastmail, and my experience of moving to it from Gmail, but I quickly found myself going on a tangent. Since privacy was the main driver in my decision to move to Fastmail, and using a custom domain is one of the ways that I protect my privacy, I figured it was important enough to warrant its own post. One of the factors that made it easier to move away from Gmail is my use of a custom domain for most of my mail. Before moving to Fastmail, this domain was tied to a GSuite account which forwarded everything to my standard Gmail account. This made switching in anger much easier, as I had fewer accounts to log in to and update my email address, and those that were still pointing directly at Gmail tended to be older low-value accounts that I no longer use anyway. This entry was posted in Articles, General, IT and tagged email, facebook, gmail, google, paypal, privacy, twitter on September 9, 2018 by Alex Forbes. I haven’t written much about privacy on this blog, despite often behaving, by some people’s standards, like a paranoid schizophrenic where my data is concerned. Until fairly recently I used to run a rooted phone with XPrivacy installed, which is about as private as you can get without ditching smartphones altogether. These days I’ve gone back to a stock un-rooted phone, partly because Android permissions have improved (although you do have to be careful with apps targeting older APIs), and partly because rooting is more risk and burden to me as a user. Also, some apps actively attempt to block rooted devices for quite legitimate (if, I would argue, misguided) reasons. Anyway, I could go on for hours about Android privacy, but the subject of this post is Gmail. We all know that Google mines your personal data for targeted advertising purposes. But when giving data to companies, there’s a balance between functionality that is useful to you, and commercialising your data for purposes that, often, are not in your best interest. This entry was posted in General, Privacy and tagged email, fastmail, gmail, google, privacy on September 4, 2018 by Alex Forbes. A couple of years ago, Hashicorp published a blog post “Codifying Vault Policies and Configuration“. We used a heavily modified version of their scripts to get us going with Vault. However there are a few problems with the approach, some of which are noted in the original post. The main one is that if we remove a policy from the configuration, applying it again will not remove the objects from Vault. Essentially it is additive only, and while it will modify existing objects and create new ones, removing objects that are no longer declared is arguably just as important. Another problem is that shell scripts inevitably have dependencies, which you may not want to install on your shell servers. Curl, in particular, is extremely useful for hackers, and we don’t want to have it available in production (in our environment, access to the vault API from outside the network is not allowed). Finally, shell scripts aren’t easy to test, and don’t scale particularly well as complexity grows. You can do some amazing things in bash, but once it gets beyond a few hundred lines it’s time to break out into a proper language. The result is a tool called vaultsmith, and it’s designed to do one thing – take a directory of json files and apply them to your vault server. This entry was posted in Articles, Code, Go, IT, Sysadmin and tagged configuration management, docker, go, make, vault, vaultsmith on August 8, 2018 by Alex Forbes. This is a blog post I originally wrote more than two years ago, in reaction to “spirited debates” I was having with developers. I didn’t post it, but perhaps I should have! Anyway the ideas within are as true to me now as they were then, so I thought I’d post it today after a bit of revision. How many times have you had a developer shrug their shoulders at you and say “it’s an upstream bug”? I heard it today, and it is so, so wrong, that it is practically an admission of guilt. Do you say that to your customers when their personal data is leaked from your database? When your app crashes their device? No? Good, because it’s your problem. This entry was posted in Code, IT on January 14, 2018 by Alex Forbes. 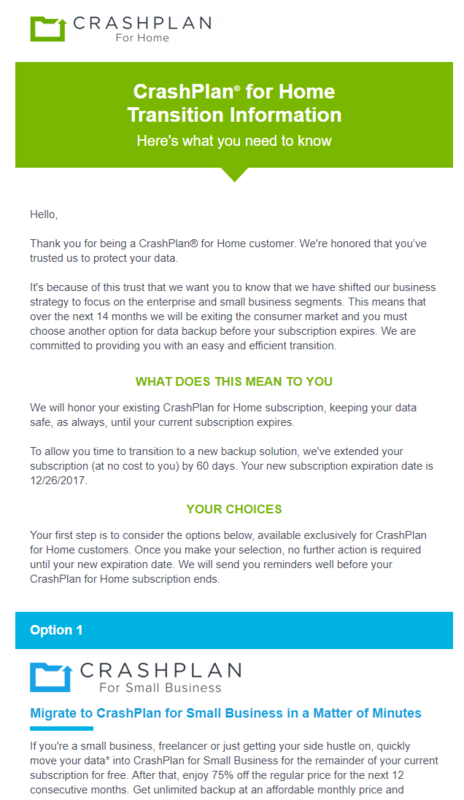 If you’re reading this and don’t know me personally, you’re probably aware that Crashplan decided to “sunset” their Crashplan Home offering on August 22nd last year. No new subscriptions are being taken, and it will cease to exist from August 2018. Unfortunately, my subscription expired in December. 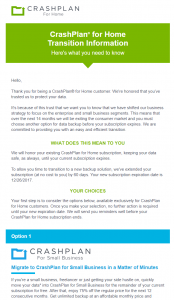 I was hugely satisfied with Crashplan, and thought it was by far the best online cloud backup solution in the market for the average home user. It offered free peer-to-peer backups which meant I could backup my devices to my own server, or even trade encrypted backups with friends. The client to backup to your own devices was free, and the cost for online cloud backups was a very-reasonable $150 USD for 12-months of unlimited backup storage. By virtue of being written in Java, the client was available for Windows, Mac and Linux (I have all 3). It supported headless operation, albeit with a bit of jiggery-pokery, i.e. editing the client config file to point to another agent via an SSH tunnel. This meant I could run it on my home NAS device, which naturally stores my important data (Photos mainly). No limits on the number of devices that were backed up, or charges per-device. This entry was posted in Uncategorized on January 13, 2018 by Alex Forbes. My first attempt was not a resounding success, but I’ll get to that. 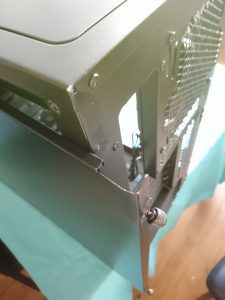 The good news is that the Fractal Define R5 case finally arrived on Monday. This entry was posted in Uncategorized on November 5, 2017 by Alex Forbes. Some of the links in this article are Amazon affiliate links, which pay me a commission if you make a purchase. 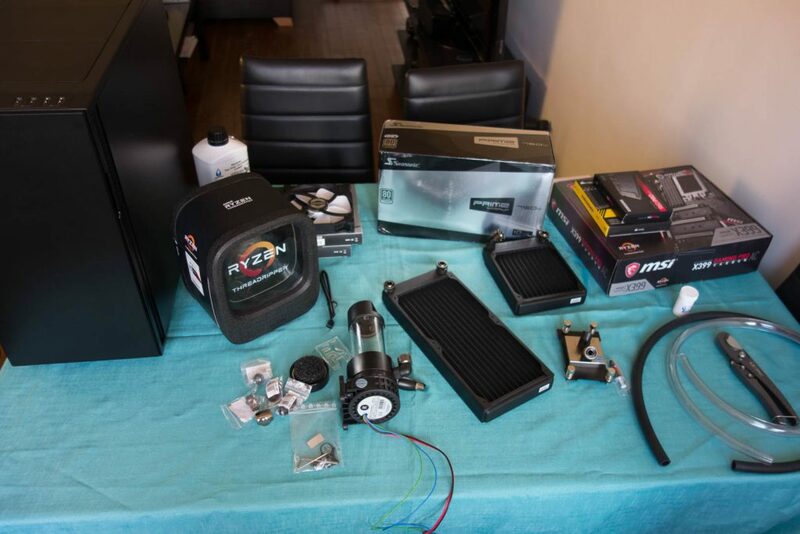 I could have brought a plain old Ryzen, a Core i7 or even another Core i5. But with Intel sitting on its hands the past 5 years in the face of no competition, I decided it was time to splash out and reward AMD for not only investing in CPUs again, but making an interesting high-end desktop product while not nickel & diming its customers over PCI-E lanes. And so, I brought a 1920X. This entry was posted in IT, Uncategorized on October 29, 2017 by Alex Forbes. Much to the chagrin of anyone that uses a web browser on my PC, with particular apologies to my girlfriend, I’ve been an enthusiastic user of Vimperator for several years. Vimperator is a Firefox extension that turns it into a keyboard-driven browser, one that behaves much like the text editor Vim. Unfortunately, Mozilla has deprecated the XUL extension API that vimperator and many legacy extensions depend on, in favour of the web extension standard pioneered by Google with Chrome. I can understand why they made this change. Legacy extensions are a large source of pain, can pose a security risk to host systems, and make invasive, sometimes unstable changes to the behaviour of the web browser. Mozilla often took flak from users for poor performance caused by poorly-written extensions, which were sometimes installed without the users’ knowledge or consent (Skype click to call extension, I’m looking at you). What’s more, XUL extensions are partly responsible for the slow roll-out of their multiprocess implementation, called Electrolysys. All this probably explains why Mozilla decided to adopt Google’s extension standard, and drop XUL. Unfortunately, Vimperator, a volunteer project, looks as though it will be a casualty of this decision, and it is highly likely that it never work after the legacy extension APIs are removed in Firefox 57. This entry was posted in IT on October 28, 2017 by Alex Forbes.